Miscellany Saturday…..Hey Dad there’re Sparks coming out of the Router! …..and in the dungeons of Barad-dur the Great Eye commanded and his servants saw his wishes through. The Elves and men who were unfortunate enough to survive the battle now went and toiled for the Master in his underground fortress slaving…making his war machine. The most unfortunate of all were those sent to work the routers….cruel despicable machines designed to drive the strongest most battle hardened to cry with despair. Yet hope remained…..while company was true and a scheme was hatched that would enrage the Dark Lord. So sorry. I just can’t seem to help myself at times. I’ve said it before and I’ll say it again: The Lord of the Rings nerd in me just has to mention stuff like this every once in a while. Apologies all around especially for those who have no idea what the heck all that means. I wasn’t going to be able to work all day Saturday to begin with because my wife and I were going up to see my daughter Georgia’s last Dance Company show at MCLA ( Massachusetts Colllege of Liberal Arts). I worked from 7 to 10 and then we headed north and had a great time. I know it’s my daughter and all but she was really cute. It was great seeing her up there on stage one final time. (She’s graduating this year.) Good job G! Me and Mommy were so proud of you.. We went out for dinner and had a terrific time at the Hub restaurant after the show. Just getting back to enraging the Dark Lord and all. I don’t want to forget this because it’s important. I just wanted Jude and Terence to rout out enough diamonds to set me up for next weekend really. And when they got there at 9;30 that’s what I told them. I need 32 large and 32 small diamonds and then you guys can call it a day. It’s probably 2 hours work. Then you guys can get out of here. (These will be for the retaining wall curb…you’ll see next week.) So I set them up and they’re working away. 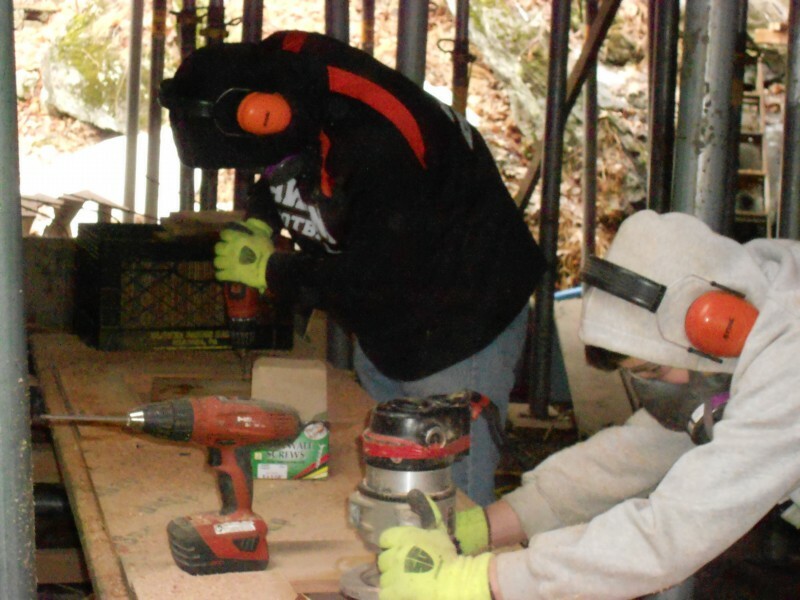 Here’s a picture of them working in the dungeons of Barad-dur. In the Dungeons of Barad-dur. Slaving for Sauron. It was a little after 10 and I was starting to wrap up so I could go home and shower for our trip to MCLA. So I’m putting my tools in the gang box and Terence comes out of the dungeon and says “Hey Dad somethings wrong with the router. There’s like sparks flying out of it.” Grrrrrr. Sparks? Sparks don’t come out of a router unless the cutting wheel hits a screw or something, and we already went over that a few times. What the heck???? So I go over and look at the bit. I mean this bit is completely shot. Wow! I knew the bit would get worn out but I didn’t think it would happen so quickly. 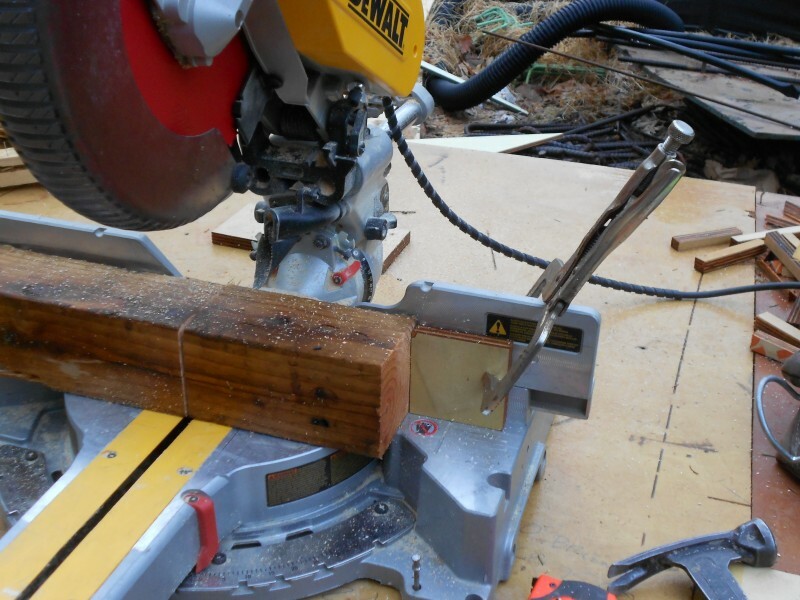 Router blades can last quite a while but when you’re cutting through laminated plywood it really wears the blade down. I believe the glue is what really does it. On top of that the bead that guides the router around the template was completly gone. A result of wear and tear? Or perhaps sabotage??? Hmmmm. The Dark Lord is definitely not going to like this. Check out this bit. Anyway, so we all wrapped up at this point. I called the Tool Nut and they put my router bit on hold for me. I’ll pick it up Monday. Oh well. The diamonds that they did cut came out really well. Decorating this Hobbit house is going to be a lot of fun. I came up with a pretty cool pattern for underneath the soffit by the front door. Hopefully I’ll be putting that in next week. 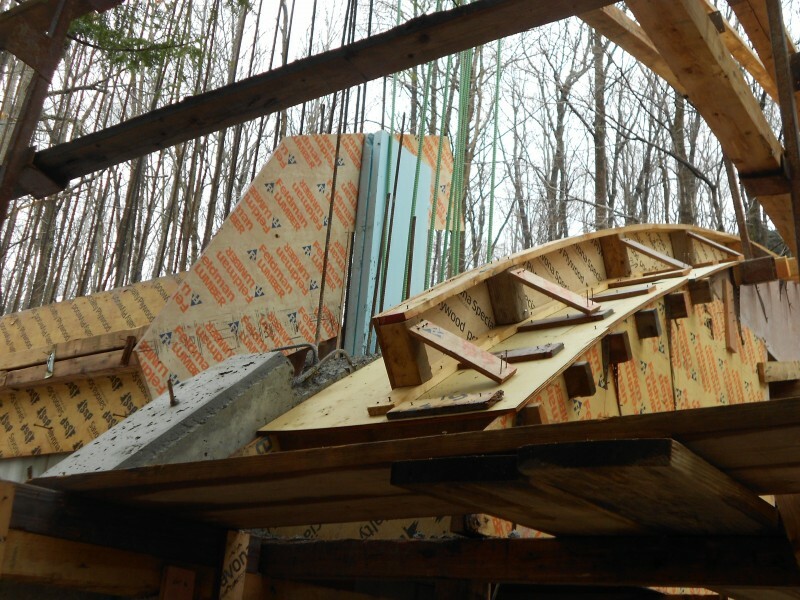 Last week I installed the spandrel sides. Finishing them off takes a few more additional steps. One of which is bracing the side itself. 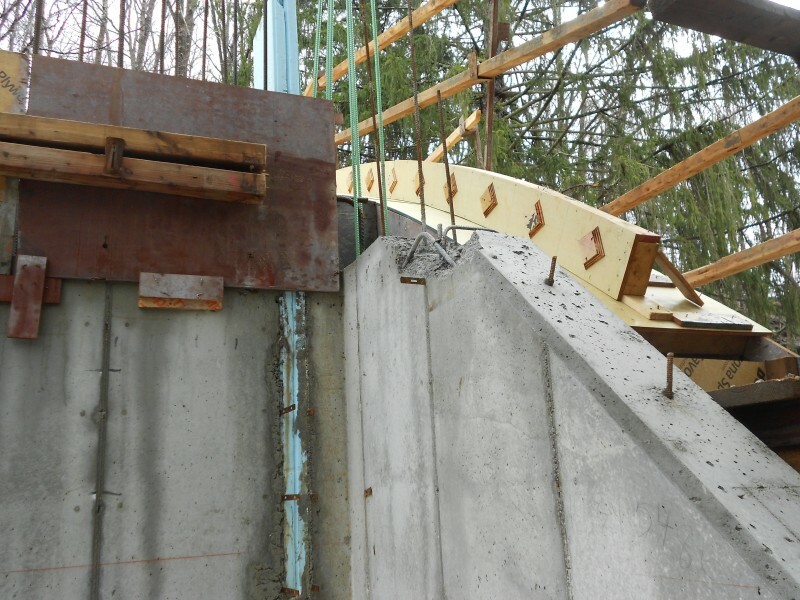 Just like any of the other concrete pours we’ve done, concrete creates a force on the side even though it’s only 9 inches high. We want to brace this side up so it’s nice and plumb and stays that way during the pour. What I did was cut a bunch of 7 inch blocks on the chop saw and install them “inside” the spandrel. 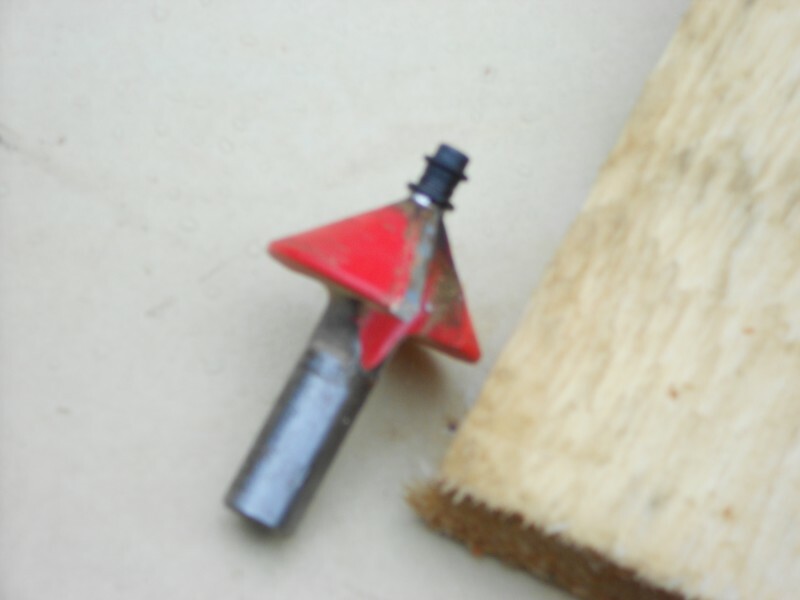 Once the blocks were in place it was a simple matter of nailing a cleat to the block to set it up for bracing. I didn’t have time to nail the brace off though. It’s a little faster with two people. One holding a torpedo level on the side and another guy nailing the brace once the guy says it’s good. A picture’s worth a thousand words…check it out. Braces are three foot on center. Just quick let me show you how I set up the chop saw for cutting the blocks. Setting the chop saw up for multiple cuts. Pretty simple right. I just clamped the block where I needed it and cut 30 blocks in about 2 minutes. No measuring no pencil lines. Boom done. I was on a roll after this. I had set up during the week the close up face for the retaining wall curb. This is really tough to expain but it mirrors the stand up face to an extent. But, it incorporates the tapered slab and gets a bit hairy as you cross the outer wall area. 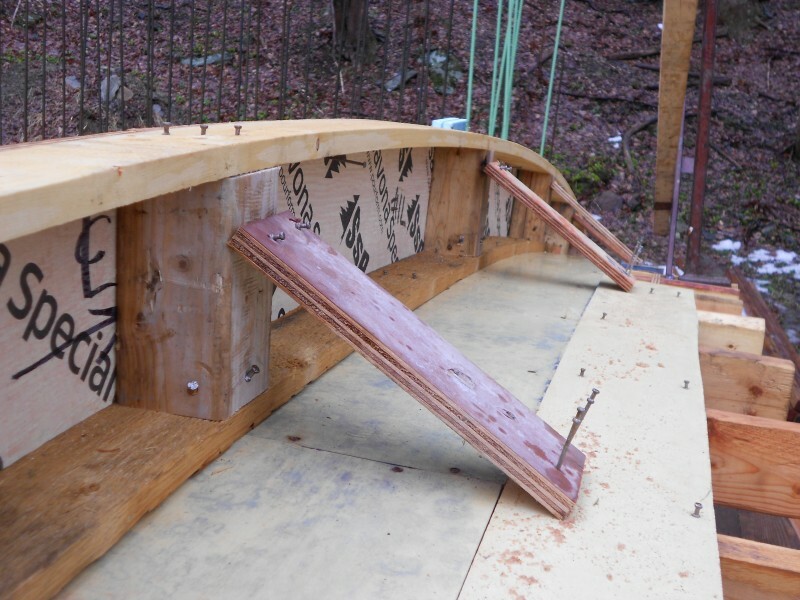 The tapered slab goes from 9 inches at the centerline of the Hobbit house and increases to 16 inches at the outer wall line. This also is at a different radius point than we used before. All the curvature of the Hobbit house was pulled from one location. This point is pulled from a point 5 feet back. This is absolutely critical for making this house work. Once again thank you Nat Tocci Engineering. Excellent job! It’s hard to see in this picture but if you look closely you can tell that the plywood is narrowing. 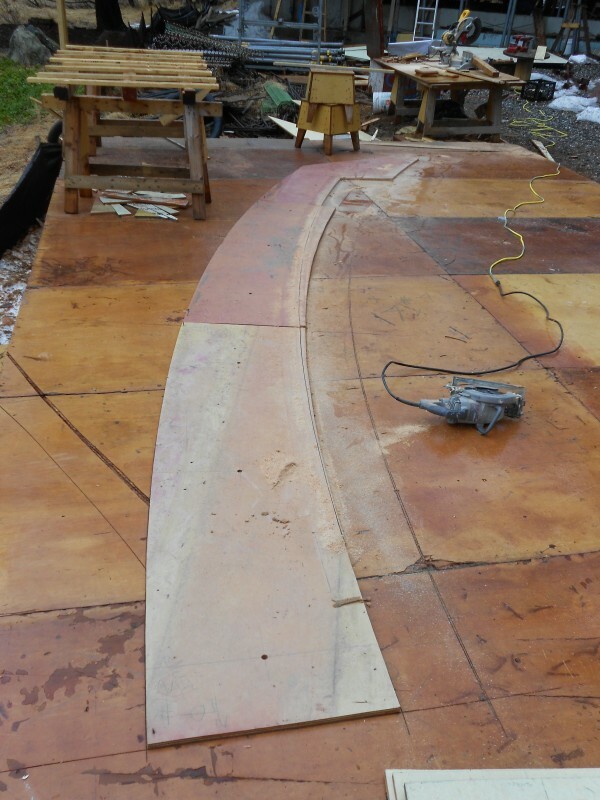 Tapered slab cut out on close up face of retaining wall curb. I don’t know if you noticed but it kind of looks weird at the end right? That’s where the curb goes up and over the main retaining wall. I really wasn’t sure how this part of the house was going to work but once I had the visual I got it. We need to change a few things before we continue. When Jude and Kevin were putting the outside walers on I just told them to run everything “to the wall line”. Now I can see this was a mistake. I should have had them run it to 5/8s back of the styrofoam thermal bridge line. Whoa….did that come out of me? It sounds like things are getting complicated.It’s really pretty simple though. Just a quick run down of what I did. First, cut back the walers Jude and Kevin installed so I could run the skill saw by later. Cut wallers back far enough so we can run the skill saw by. Once this is done I marked out where I wanted to cut the plywood back. 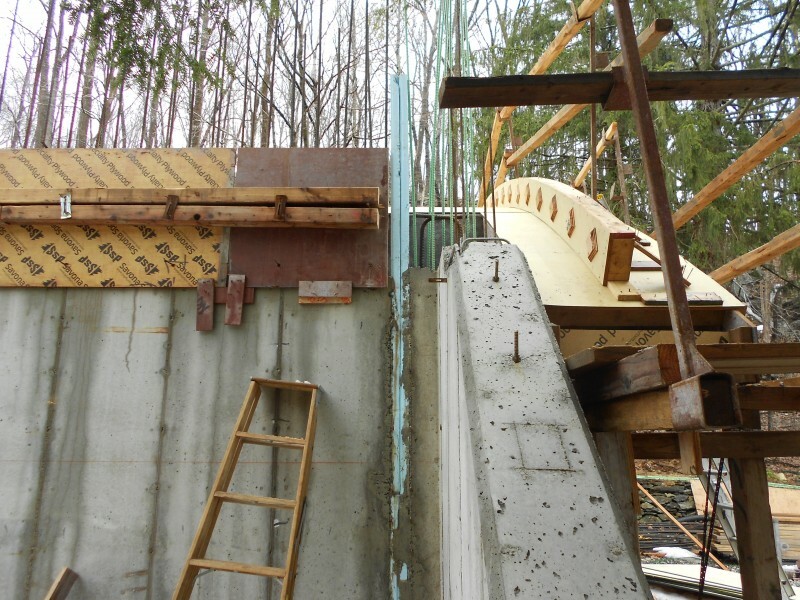 The retaining wall curb close up plywood has to run by the styrofoam. I marked it 3/4 of an inch back to give me a bit of wiggle room and used a level to plumb up the line. Check out the cut. Plywood cut back for close up. Retaining wall curb close up as it goes over the wall line. I know I know what the hell is that? Well, it doesn’t seem like much but it means a lot to me. Anyway thanks again for stopping by and I hope to see you all again next week or soon thereafter. Enjoy your week! And the new router bit better last a long time or the Dark Lord is really going to be p’oed.